My left foot was throbbing and radiating pain. I couldn’t even weight it without grimacing. And I was feeling quite depressed. 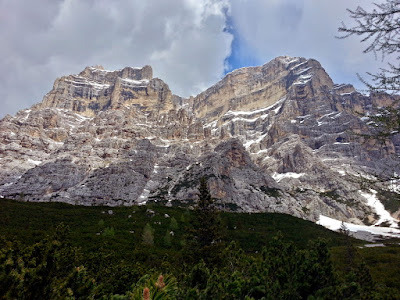 I was in Italy and in three days I was supposed to meet up with Bill and run the first annual Dolomiti Extreme 53 kilometer trail race in the majestic Dolomite Mountains of northern Italy. 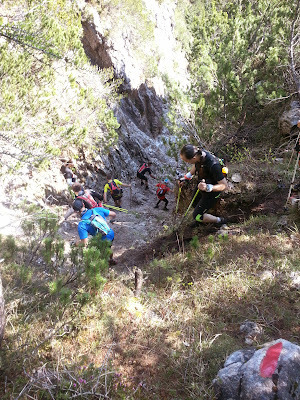 The way my foot was feeling, though, there wasn’t a chance I’d be able to run, or even walk, 53 kilometers of rugged trail. 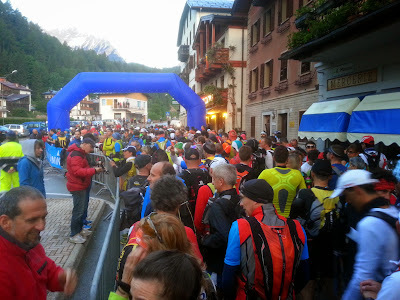 I’d spent a good deal of time and money to get here and now, just days before the race, I felt I’d be sitting in the hotel room during the race instead of enjoying the company of 350 other runners in the scenic Dolomites. 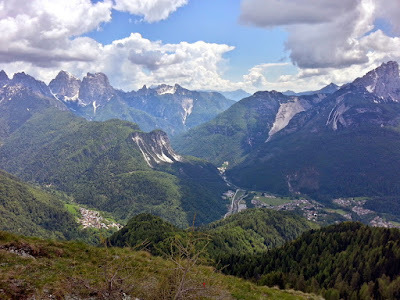 Earlier in the afternoon, Nat and I had gone for a hike up Cima Capi (900m) outside of the town of Torbole near Lake Garda to consume the views of Lake Garda from the summit. The day had been excellent. Our group of four--Allison, Stephanie, Nat and me--had done some rock climbing at a nice, newer crag called Bassilandia and then explored a unique via ferrata through a slot canyon-like gorge below the Drea Castle. 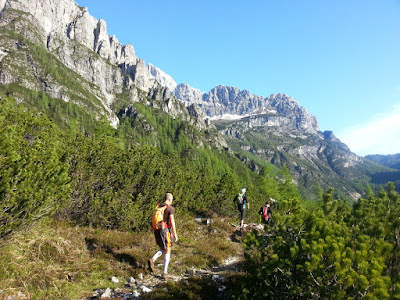 Our hike up 2700’ vertical of Cima Capi had been enjoyable and swift. However, as we reached the top, my left foot began aching. I had banged it a little bit earlier in the day while climbing and thought that was the cause of the discomfort. So I just gritted it out. But as we descended, the pain got increasingly worse until I was obviously limping and favoring my other foot. By the time we got back to our rented apartment, I couldn’t even weight the foot. What was going on? I’d never felt this much pain in my foot. Thoughts of writing off the rest of the trip went through my mind as my attitude soured. I went to bed thinking I had done something serious to my foot and that perhaps much of my summer would be impacted, not just the race in a few days, by this injury. I nodded off to a fitful night’s sleep as my foot throbbed. When I awoke my foot was tender to the touch but feeling quite a bit better. Still, as bad as it had hurt, I planned to do nothing for the next two days to give me a shot at running at least half of the race on Saturday. Thursday morning the four of us went rock climbing at one of the more famous and historic crags in the Arco area, Massone. My plan was to just belay all day and take it easy. But I’m not very good at taking it easy and the temptation to climb was too great. I hopped on a climb and found my foot didn’t hurt while climbing. This was good news…at least I could climb for the rest of the trip. 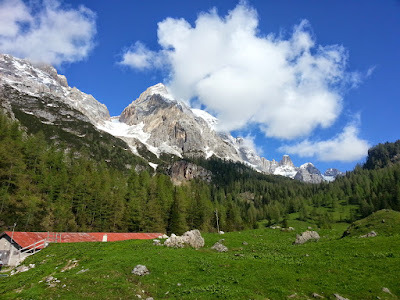 We enjoyed a great day of climbing before heading north to the Dolomites to meet with Bill and Rebecca. As the day went on, my foot felt better and better. I was even walking without a limp now. How could this be? I couldn’t even stand on it the night prior. 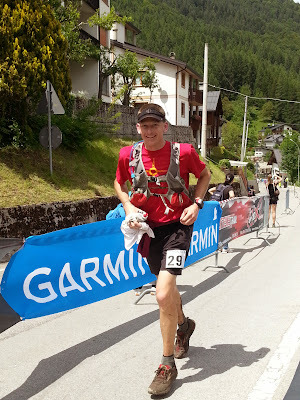 This was my first non-American ultra race and I was super excited about it. The Europeans have a reputation for being strong ultrarunners. Also, they have a reputation for running in lycra capris and using poles liberally. All of these reputations are spot on. Bill and I stuck out like, well, Americans, at the start line in our short-sleeved shirts and non-skin-tight running shorts. We did look like everyone else in that we both had running backpacks on. The race organizers require each participant to carry a few mandatory items including a whistle, a cell phone, a flexible bandage, a space blanket, long pants, long-sleeved shirt and a rain jacket. Also, the race was advertised as being “cupless” so I carried a hand bottle in addition to the hydration water bladder in my pack. All of this mandatory equipment was much more than I would normally carry in a 53 kilometer race. And I really don’t like running with a pack. 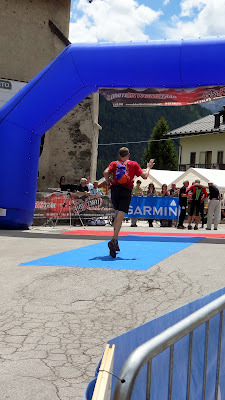 But alas, it worked out well and my old school Ultimate Direction Wasp pack served me well in yet another race. The race is a 53 kilometer loop starting and ending in the town of Forno di Zoldo in the heart of the Dolomites. The course climbs 11,500’ and descends about the same amount (the finish is uphill from the start so it’s not quite 11,500’ of descent.) At 5:30am we started from the main street in Forno di Zoldo. It starts getting light around 4:15am in the summer in the Dolomites so no headlamp was required. Bill and I were quite a ways back in the pack at the start and the race quickly funnels into some narrow streets before entering even more narrow trails. So we resigned ourselves to sticking together for a while and just enjoying the easy pace behind roughly a hundred runners in front of us. From the start the race more or less just climbs and climbs to Passo Duran, a pass with a paved highway crossing it. Rebecca met us there to take some photos and give encouragement. After Passo Duran we climbed even more towards the base of Monte Moiazza as we ran towards Monte Civetta. 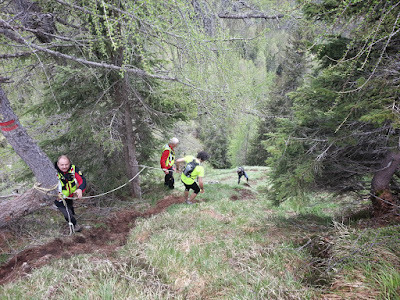 The course was extremely muddy through some lush meadows as we ascended. At one point my left shoe got stuck in the mud, mid-stride, leaving my shoe in the mud as my foot continued forward. I was able to stop before plunging my socked-foot into the mud, though. More steep climbing awaited us and the queue slowed to a very easy pace as we all just grunted up towards a small water stop at about mile 11. After the water stop we descended on some steep, slick trail for about a mile before entering the top of a really steep, loose gorge/couloir. A volunteer at the top cautioned us to take it slow. I peered into this couloir and was a bit surprised the course actually went through it--it looked pretty sketchy. I worked my way down into it slowly and was being very deliberate so as to not kick rocks down on the others below. But some overly-motivated runner above me decided to be extremely disrespectful and dangerous and tred to move quickly through here. He quickly yelled, "rock!" and I looked up to see a rock the size of my torso coming down. I sucked up against the wall as the rock tumbled by and, thankfully, stopped before endangering anyone else. He apologized profusely (at least I think he was apologizing--I couldn't understand the language) and we all carried on to the more firm trail below. The spacing between runners was opening up and I felt happy to be able to actually run and power hike quickly up the ascents for a few more miles. Because Bill and I had gone out so slowly, my energy level was high and I was feeling great as the scenic miles ticked off and I passed a number of other runners. We traversed for quite a while well below the huge faces of Monte Civetta (the banner image for this blog post) and I watched and heard numerous avalanches tear down the rock faces above. I was thankful the course had been re-routed to this lower elevation! 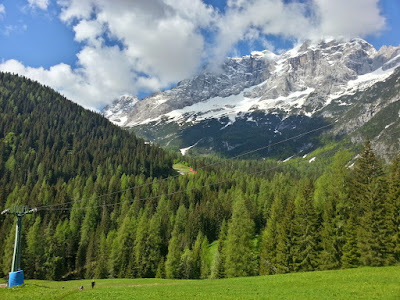 Looking up at Monte Civetta from the ski area. We dropped down to the mountain town of Mareson-Pecol before heading up a ski area outside of the town. Here the air was still and the sun hot so it became a bit of a grind up the mountain. 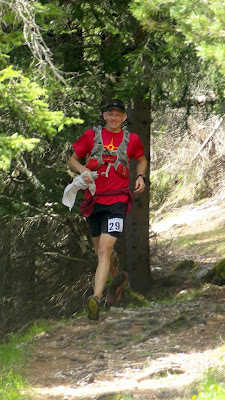 But I was still feeling pretty strong and able to pass by a number of runners before reaching the top of the ski area and heading towards the mile 23 aid station at the crossing of the major highway 251. I was looking forward to this aid station because it was the one spot on the course where I'd see Allison. Her, Rebecca and Stephanie had driven up there to cheer us on as we passed through. I could hear the cars and stepped up my pace on the easy downhill single track. I rounded a corner and there they were cheering and clapping. It was a very nice boost! From the aid station we climbed up a bit before running some really nice single track at treeline traversing along the base of the impressive Monte Pelmo. The huge limestone walls of the west and south faces had me dreaming up coming back to climb up there. And then I began to notice the clouds. The afternoon storms were starting to roll in but it looked clear where we were headed so I figured I had some more time before I'd get wet. Nice, enjoyable running on undulating terrain kept me rolling for the next few miles before a relatively short but very steep and slick grassy descent got my attention. This section had a number of climbing ropes strung up between trees with volunteers standing by each rope to warn and assist runners. I'm pretty comfortable on steep terrain but was quite happy to have the ropes there. A very impressive descent option! Run, run and run some more and then finally I was on top of the last climb and peak of the run, Monte Pointe, with only 8km of descent back down into town and the finish line. I ran pretty well on this last, long descent but had to make an extended pit stop in the trees to see a man about a horse. As I ran into town and hit pavement, I thought, "alright, the homestretch, I'm gonna hammer it home." I picked up the pace and started running hard and letting it all out but, wait, we're leaving the pavement and going back up again? Damn! So it was, we did another short ascent and hit some more really muddy trail for half a mile. I could hear footsteps coming up from behind me so I kept on running as hard as could splashing through the sticky mud. And then we were back on pavement again and people were cheering from houses along the road. The energy was contagious and my legs kept spinning fast as I gained on the person behind me and could no longer hear the steps. It was really cool flying through the narrow streets lined with houses and small cafes! I managed to crank by a couple of other runners with about a half mile to go and soaked in the energy of the crowd at the finish line as I crossed it in 8 hours, 44 minutes and 31 seconds. What a grand race experience!